So there I was in the White House about to meet the president of the Untied States, and I had to think of something to start up a conversation. 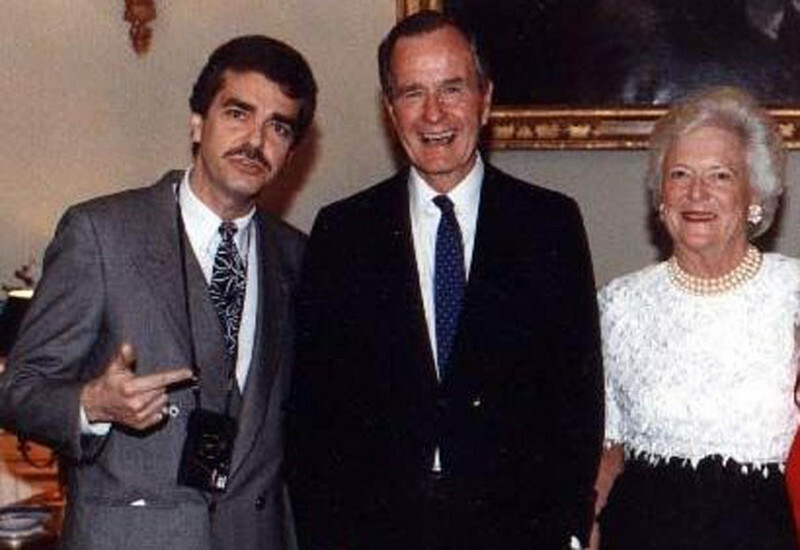 I would have just a couple of minutes to stand next to George H. W. Bush, because it was only a photo opportunity with him and Barbara. As I stood in line to greet them, I noticed the others before me were simply sharing nervous "hellos" with the first couple and posing for a quick photo. "I'll have very little time," I told myself. "I'll have to talk even while the photo is being taken." To keep the line moving swiftly, the White House photographer was reminding everyone they would receive copies in the mail. But I wasn't worried about the photo. I kept searching for a way to engage the president in a conversation. The people in line behind me would have to wait! It was June 14, 1992 and Bush had just returned from the Earth Summit in Rio de Janeiro, where, one day earlier, a news photographer had captured him standing close to Cuban dictator Fidel Castro. I decided the photo would be my icebreaker. "Mr. President, I saw you in the Washington Post this morning, and you were standing next to Castro!" I said as the camera was clicking, immediately igniting the dialogue I sought. "No, no, no," Bush snapped. "I was trying to stay way from him. That photo made it seem as if we were closer than we were." It was true, their proximity was distorted by the photo — and I knew it. But it gave me the perfect opening to say what most Cuban-Americans would tell the president of the United States: "As long as they are violating human rights and civil liberties, you stand strong against the Castro regime, Mr. President, and we'll be behind you." That moment came rushing back to me last week as I watched the repulsive images of President Barack Obama shaking hands with Cuban dictator Raul Castro at Nelson Mandela's funeral in South Africa. Of course, nothing has changed in Cuba since Bush wisely avoided standing next to its bloody dictator. The Cuban people still have no freedom. Cuban prisons still are filled with dissidents. Human rights are still routinely violated. With almost 55 years of murder and torture, the Fidel and Raul Castro regime continues to be one of the longest-running dictatorships in human history. While the United States has sought human rights concessions from the regime in exchange for better relations, Cuba has stubbornly remained one of the world's most repressive countries. There is no reason to believe the Castro brothers are going to be so charmed by Obama they'll release political prisoners, allow freedom of expression, a free press, free elections and initiate other reforms that would dilute their absolute power. In fact, in the past, when the U.S. government has been on the verge of lifting the economic embargo against the Castro regime, it is they who have done something crazy to stop it from happening. They complain about the embargo, but when former President Bill Clinton was close to lifting these sanctions, the Castro regime had one of their Russian MiGs shoot down two civilian U.S. airplanes flying over the Florida Straits. So why would Obama befriend a sworn enemy of the United States and sponsor of terrorism? Why shake a hand stained with Cuban — and American — blood? Until now, the U.S. government, including the Obama administration, had held a principled position on Cuba: No progress could be made in U.S.-Cuba relations until the dictatorship made human rights concessions and released its chocking grip on the Cuban people. U.S. presidents stayed away from Cuban dictators because they wanted to show the world that the nation stood by its principles — and that those who suppress, torture and murder their own people cannot be our friends. Yet many pundits are telling us the recent Obama-Castro handshake was meaningless and that Obama was only being polite. They say he had no choice because Castro was in his way and the whole thing was spontaneous. Bullcrap! If Obama had wanted to avoid Raul, just as Bush avoided Fidel in 1992, he could have done so easily. But instead, he chose to behave like a hypocrite, delivering a speech condemning world leaders "who claim solidarity with Madiba's struggle for freedom but do not tolerate dissent from their own people" and yet shaking hands with one of those leaders. Of course, the handshake has led to speculation by those believing it was much more than a meaningless gesture. "Does this mean Obama intends to ease relations with Cuba without obtaining freedom concessions from Castro?" they fairly ask. "When the leader of the free world shakes the bloody hand of a ruthless dictator like Raul Castro, it becomes a propaganda coup for the tyrant," Rep. Ileana Ros-Lehtinen told Secretary of State John Kerry at a House Foreign Affairs Committee meeting last week. "Raul Castro uses that hand to sign orders to oppress and jail democracy activists." Many Americans accuse our president of being a closet communist, but until now, it seemed unlikely Obama would dare befriend the Castro brothers. But now that he is no longer running for reelection, now that he no longer cares about the Cuban-American vote in Florida or a backlash from anticommunist Americans, there is a disgraceful handshake picture that speaks louder than words.